Sometime back, you have read several articles I wrote about Buzzlogix. Those days, Buzzlogix was just a social media marketing tool that was in beta testing. Not long after that, it has grown from a small-sized social media tool to a full-fledged tool that is used by both beginners and advanced social media marketers. Today’s post will be on the latest Buzzlogix growth and updates. They had rolled out a new feature which is said to make Buzzlogix on par with the rest of the popular social media marketing tools in the market today. What is it? It is Buzzlogix’s User Group Management for Agencies and Business Units. Did you hear the bells ringing in your ear? Yes, Buzzlogix is now fully functional as a social media tool for both beginners and companies. This is certainly an important step especially for business owners and digital marketing agencies. Are you ready to dive into it? I bet! What is Buzzlogix? Buzzlogix is a social media monitoring and engagement tool that helps you listen in real time on what people are talking about your brand, products, and services you are offering. The biggest and most powerful feature in Buzzlogix is the Smart Assistant where it provides a ton of features for solopreneurs and business owners alike. The wizard-based configuration which allows you to configure the way the reporting works. This means that you can simplify your social media campaigns, measure results and even automate tasks to save more time and become more productive. Generally, you can now create a hierarchical user management structure. According to Buzzlogix, you can now decide which Topic Streams, Analytics Reports as well as specific social media profiles your colleagues or users can access. This allows you to have better control over what can be shared and in most cases, this is very important especially when you are managing multiple clients and staffs under your supervision. You certainly wouldn’t want everyone to have access to every contact you have to the urgency of the matter. BY default, you have three options which are Administrative, Edit or View-only rights. You can easily assign a role to your colleagues or users so that they can do the work properly and efficiently. The first step is to setup the user group management. Head over to the gear button/icon on the top right of the screen to open the option. Then, toggle to the account management setting to adjust the user access and group settings. If you don’t have one, you need to setup on one first. I highly recommend you to have or create a plan to start with to avoid any complication in the future. Take a look at the image below. You will see this option on the account’s page (scroll further down on the setting page). Here, you have two options to start with. I recommend you to start creating a group (in this case, the image on the right side). You can easily create a group in just seconds or under a minute. Here, you need to choose the type of content visible for the group. There are four steps to complete this. 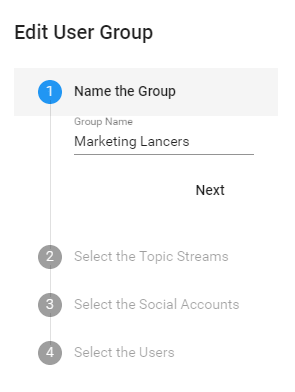 The first one is to have the group name, followed by selecting the topic streams, selecting the social media accounts and finally, the users which have the access to view or administrative role for the group. Now, this is pretty cool, don’t you think? Using Buzzlogix User Management tool, you can now have complete control and even invite others to your account. Inviting can be done through this icon here. Once you have send out the invitation, you can view the status of the invitations in just a glance. This is located right below the Account Users setting. 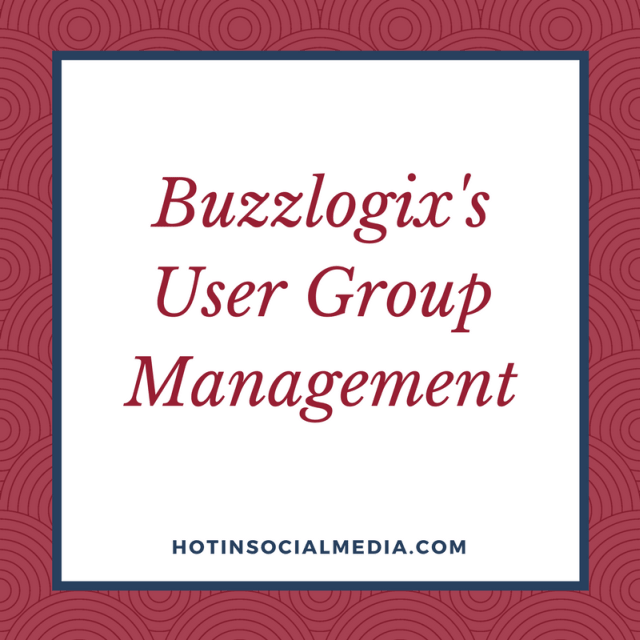 Why is Buzzlogix User Group Management for Agencies and Business Units Powerful? The tool itself is extremely comprehensive and thus, able to deliver effective social media management and monitoring. The Buzzlogix team always believe that both social media marketing and management must be made simple – thus, their goal is always to create simple, highly affordable and powerful performance for many. Why should you consider using Buzzlogix? The first advantage of using Buzzlogix is the level of accessibility. You can use its powerful cloud software and mobile app to generate important market insights, as well as managing all your social media accounts under one go (regardless wherever you are). Secondly, the Smart Assistant feature allows you to operate smarter and produce highly productive team members. The software itself is easy to use and therefore, you don’t have to spend hours or days trying to understand how it works. Gone were the days where you need to attend onboarding training and even on job training just to use the tool properly. From setup to usability, Buzzlogix allows users at all levels of expertise to leverage the true power of social media through highly detailed features. Now, how much does Buzzlogix costs? Typically, it comes in five simple plans. Which is the best plan for agencies and small team? The answer is simple. If you are looking for the right plan for a small team or digital marketing agencies, Pro Plan is the best. For starters, it allows you to receive up to 50,000 mentions which are really useful. More importantly, the plan comes with 8 analytics reports which you can generate for your clients. After all, analytics reports are always the selling point for digital marketing agencies alike. At the price of $99.95 per month, this is definitely your best choice and worth every penny you spend! If you have a bigger company or have a large database of the client, you may want to consider the Enterprise Plan. It comes with 4 times more mentions (250,000 mentions per month) compared to the Pro Plan and 16 analytics reports. For the price of $399.95, this is one of the best cheapest Enterprise social media management and monitoring tools in the market. You will notice that most third-party tools offer massive charges just for analytics reports. Thus, Buzzlogix is definitely the best option for you – regardless it is for a small team, business or large agencies. Buzzlogix had improved dramatically over time and it is slowly heading towards the top of the tier. It’s social media management and monitoring tool is one of the best in the market and more importantly, it is super intuitive to use. I remember setting up my Buzzlogix account for the first time and it took me less than 5 minutes to do so. There is no API works or any coding that you need to know or even struggle to implement. All you need to do is the integrate Buzzlogix to your social media accounts that you manage and you are all good to go!